The Grandview condos for sale sit in its own park in the crook of Grandview Road, just north of Four O’clock Run. 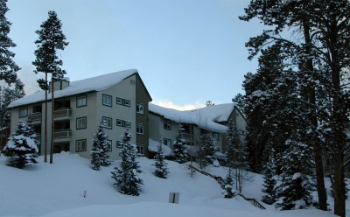 The 47 units in this complex are in two large, multi-story, connected buildings, and the units are modest, but have a terrific view to the Ten Mile Range or Baldy Mountain depending on which side of the building the condo sits. While there are no garages, plenty of parking surrounds the condos. Start browsing the Grandview condominium listings below, or read on to find out more about owning a condo in Breckenridge. Four O’clock run passes by Grandview Road, so it’s easy to ski home from a day on the mountain – from mid mountain take Four O’clock run to Grandview Road, click out of your skis walk across the road to Grandview Condos. Alternatively, the free town shuttle bus stops a block from the opposite corner of the Grandview Property – on Ski Hill Road - and transports riders to the base of Peak 8 or to downtown Breckenridge. The Breckenridge Nordic Ski Center is across Ski Hill Road from Grandview, and is an easy walk. The Nordic Center and Four O’clock are trails in the summer that link Grandview residents to more forest trails and activities on the ski mountain. Grandview’s location make it appealing to homebuyers looking for a ski vacation home, or as a convenient home for locals. Easy access - summer and winter – from Grandview Condos to mountain biking, hiking and ski trails. This location fits in well with the mountain lifestyle many full time residents enjoy. These condos have an efficient floor plan and many have a wood fireplace. Size: 694 sq. ft to 861 sq. ft. Amenities: close to Four O’clock Run, near bus route, access to trails, views. Starting at main street or Park avenue Follow skihill road west toward the Breckenridge Ski Resort. Turn left after 1 mile on Grandview Drive. Grandview Condos will be on your right in .3 mile. Want to know more about Grandview condominiums? Talk to a local pro today!